A hangover after drinking alcohol is something everyone has experienced at least once in life. However, some people may experience the symptoms of a food allergy when drinking alcohol. Odd digestive symptoms, flushing, itchiness, and other symptoms may occur after drinking a glass or two. If this is your problem, then you probably have an alcohol intolerance and allergy. Allergies to alcohol, better to say to ethanol are very rare. But, alcoholic beverages are not pure ethanol only. They contain many other ingredients to which you might have an intolerance, or even develop an allergy. An intolerance to sulfites is also possible. Is there any alcohol without sulfites and is it safe for you to drink it? Sulfites intolerance or allergy is possible. Sulfites as a component that acts as a preservative, preventing and limiting the growth of yeast is commonly added to beer and wine. Potassium bisulfite and potassium metabisulfite are mostly used for this purpose. Another ingredient that can lead to intolerance and allergy after drinking alcohol is sulfur dioxide. In persons already suffering from asthma, drinking alcoholic beverages that contain sulfites might trigger an asthma attack. Others have allergy-like reactions when drinking alcoholic beverages. The level of sulfites is much higher in white wine, compared to red wine or beer. You can easily assume that avoiding white wine is enough, and drinking red wine or beer is allowed. However, that is not correct and avoiding sulfites totally is obvious. Domaine Valentin Zusslin Cremant Brut Zero from Alasce is a sparkling wine made from ripe fruits, lean and mineral, with no sugar and no sulfur. The price for one bottle of this delicious wine is $25. Chateau Le Puy Cotes de France from Bordeaux is another sort of wine with no sulfites. Their red wine of 2006, with a price of $42 is a wine with floral essence, of a velvety texture, with red fruit. Donkey & Goat The Prospector Mourvedre from California at a price of $30 a bottle is not made completly without sulfur, but the sulfur it contains is so minimal. The wine is plumy, earthy, and with the right acidity as well. Try this alcohol without sulfites. Frey Vineyards Natural Red NV from California is one of the best organic and biodynamic wines available on the market today. The price is very affordable, only $9 a bottle. The winemaker claims that the wine is sulfites free, comprised of Zinfandel, Syrah, and Carignan. It is an easy drinking and fruity sort of wine. Catherine & Pierre Bretton from the Loire produce wine with no SO2, from organically grown grapes. Their 2006 Catherine & Pierre Bretton Bourgueil Nuits d'Ivresse is a 100% Cabernet Franc, with no sulfites. The price is also acceptable, only $26 a bottle. Bottles of this wine should be stored below 14 degrees Celsius. A minimal amount of sulfites is added only before the bottling, but which is not detected in testing. Pierre Frick from Alasce also produces wine without sulfites. The price of the wine bottles, Riesling and Pinot Noir range between $22 and $24. This is another great alcohol without sulfites. Cascina Degli Ulivi Filagnotti from Piedmont is produced in a strictly organic and biodynamic farm. Their wine is with a nice minerality, fruity, funky, and silky as well. One bottle costs $22. Red wine is the alcoholic drink which triggers symptoms in most of the cases. 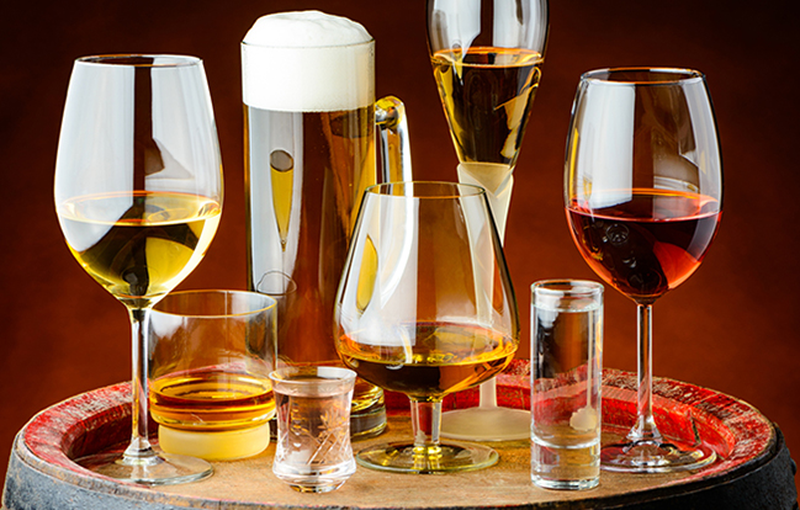 Other alcoholic drinks that can cause alcohol allergy are whiskey, beer, other types of wine, etc. The allergic reaction can be triggered by a specific compound which is part of the alcoholic drink or which has been used during the production process. In cases of whiskey, a grain that is used to make this alcoholic beverage can lead to an alcohol allergy, while in cases of wine, the type of grapes that are used in wine production can lead to an alcohol allergy as well. It is believed that congeners used in the production of certain types of alcoholic beverages which add aroma, flavor, and body to the drink can also trigger an allergic reaction to alcohol. Additives, like sodium benzoate, tartrazine, etc. Fruits and flavoring, like grapes, apples, berries, oranges, coconut, etc., can lead to an allergic reaction in persons who are allergic to a specific fruit. Server responsed at: 04/22/2019 2:15 p.m.